In 2015, Chinese steel output decreased 2.3% - the first year of decline since 1981. According to the China Iron and Steel Association (CISA), total revenues of its members decreased 19% in 2015, to about CNY 2.89 trillion (EUR 392 billion), while the overall net loss amounted to CNY 64.5 billion (EUR 8.7 billion). In Q1 of 2016 Chinese steel demand and businesses’ profits picked up due to some government stimulus measures. However, the rebound has been short-lived, with profits decreasing again in June 2016 and steel demand expected to decline 4% in 2016 and 3% in 2017. The adverse market conditions will probably deteriorate in 2016 and 2017. Steel prices continuously declined over the last four years. Overcapacity remains the main challenge, as the rebalancing of the Chinese economy from investment and export-oriented driven growth towards private consumption continues. China’s GDP growth is expected to slow down to 6.5% in 2016 and 6.3% in 2017, after 6.9% in 2015. In 2015, Chinese steel exports increased 20.3% year-on-year, to 111.2 million tonnes. This growth slowed down to 11.5% year-on-year in Q1 of 2016, and it is expected that steel exports will bottom out in 2016 and decrease thereafter, as more countries impose duties on Chinese steel imports. In March 2016, the US imposed import duties of 266% on certain Chinese steel products. In January 2016, the EU announced the imposition of new tariffs which focus on the construction-use steel bars and these were raised from 9.2% to 13%. 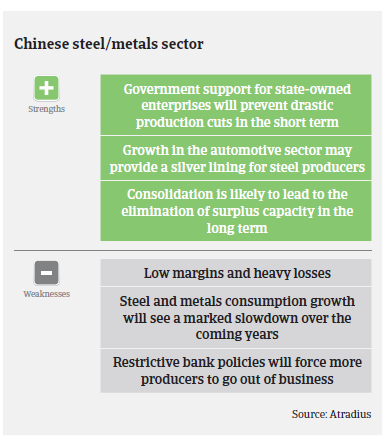 China’s government has repeatedly said that it will reduce steel overproduction and consolidate the industry, e.g. the goal is to concentrate 60% of the country's total steel capacity in the hands of its top 10 steel producers. However, success has been limited so far as regional governments have a strong incentive to support local production where possible to maintain employment and prestige. While a comprehensive consolidation of the sector still has a long way to go, in 2016 consolidation efforts have finally been reinforced. Accusations of Chinese steel dumping will also pressure the government to scale back domestic steel production and exports over the coming years. According to the World Steel Association China's steel output is expected to contract by an average of 1.4% annually from 2016 to 2020, compared to an average growth of 4.9% from 2011 to 2015. For both steel manufacturers and steel traders, bank financing is the major source of funding. High leverage has been an outstanding issue over the last couple of years, together with shadow banking, while many steel companies have repeatedly pledged the same collateral for loans from several different banks, thus multiplying the risk. At the same time, loans - especially to steel traders - are being used for purposes other than investment in steel: i.e. to invest in more profitable businesses. The intertwined nature of loan guarantees in China's steel sector implies that credit default by a single company could trigger a chain reaction across a string of other firms which are often guarantors of debts for their bankrupt competitors. For all those reasons, there is a high potential systemic risk for banks, forcing them to cut loans. In 2014, many banks suddenly revoked credit lines all of a sudden, which forced many players to leave the market immediately. Payments in the Chinese steel and metals industry take between 60 and 120 days, on average. Payment behaviour has been very bad over the past two years, and a further increase in payment delays is expected in the coming months. 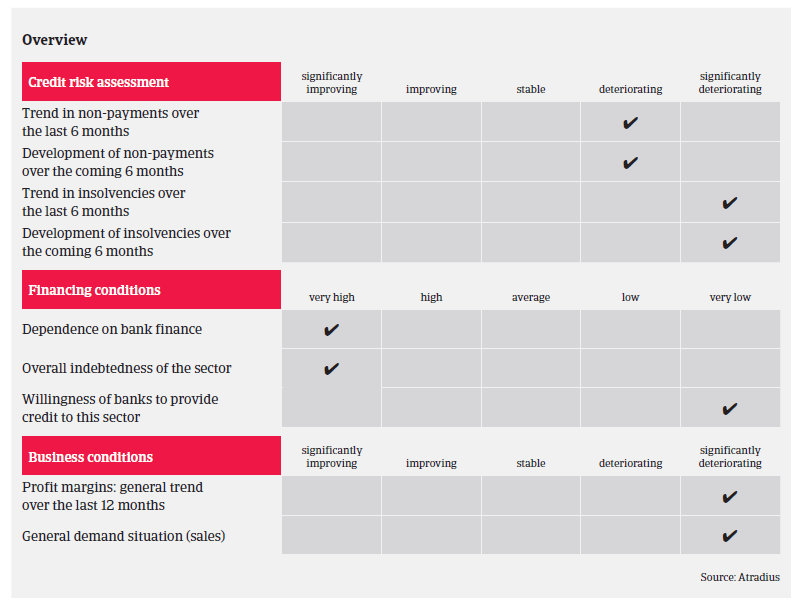 Insolvencies have increased substantially in 2015 and H1 of 2016, and are expected to increase further due to the combination of the slowdown in construction activity, and the low margins, net losses and high gearing of many steel businesses. While leading state-owned steel makers still show some resilience, many private owned steel and metals producers face serious trouble. Many Chinese steel and metals traders do not have many fixed assets, and suffer from slim margins and very limited bank facilities. 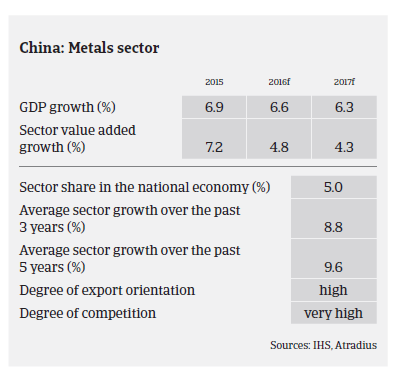 Given the currently poor performance, our underwriting stance is very restrictive on the steel and metals sector.